Wednesday morning, Steve walked up to give Ray a hand with his final pack-up and then got started on ours. I finished getting myself cleaned up and then got going on my pack-up inside. Before we knew it, Ray and Freya were down to say goodbye. After big hugs and handshakes...and a cookie or 2 for Freya...they were on their way. Shortly after 10:00 we pulled out of our site and headed to the sani-dump...there were no other rigs there, so we pulled right in. Unfortunately, that's as far as our luck went. Our rig has a really nifty set up for the sewer hose...it's enclosed in an arm that swings out. This time when Steve pulled out the hose, it all came out...it's supposed to stay connected inside the 'arm'. Great...this is not a good start! The upside to this is it happened before Steve opened the valve to the black tank which woud have been nasty! Steve started to bring out his tools to disassemble the arm so he could re-connect the sewer hose, but just as he started with that, two class A motorhomes came up behind us. So he put it all back...we'll have to find a spot to pull over to fix it. After he had it all fixed, we were able to turn around, re-enter the park and go back to the sani-dump. This time, though, there was a line-up of 4 rigs...so we had to wait. It was going on 11:30 by the time we pulled out of the State Park...over an hour later than we had planned. No big deal, I guess...we only have about an hour and a half drive. 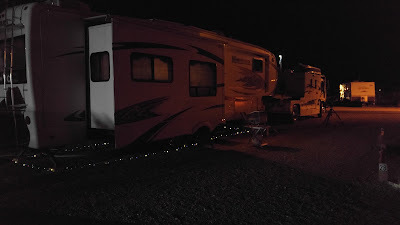 We pulled into High Chaparral RV Park, just south of Casa Grande, at about 1:00. We checked in and got directions to our site, F29. The park is nothing fancy, but it has large gravel pull-through sites with plenty of room between you and your neighbour. There is a small club house, library and laundry facilities. They have plenty of social activities, including a group that ride their ATV's out into the surrounding desert regularly. We actually chose this park on the suggestion of Deb and Ray who have spent the past couple of Christmas Seasons here with friends from Victoria, BC. Wayne and Karen have spent their winters here for the past number of years...nine, I think. So Deb sent Karen an email introducing us...and Karen and Wayne have "taken us under their wing". About a half hour after we pulled into our site, Red and Pam pulled in. They are on their way from Texas to spend Christmas with Pam's folks in Sun City and contacted us yesterday to let us know that they had managed to reserve a site at High Chaparral for two nights. When I spoke to Pam this morning, they had almost 300 miles to go...so we weren't expecting them until much later. So you can imagine our surprise when they pulled in! We're so excited to see them...it has been two years! We had a great visit and then Karen and Wayne had to leave...they had dinner obligations. Red and Steve helped carry some of Karen and Wayne's stuff back to their site and on their way back their neighbours John and Sandy called them over. After introductions were made they gave them a plate of BBQ'd Jalapenos Dove breasts, wow were they ever good! Wayne and John go Dove hunting every few days. Red wanted to pay forward the Dove appies so he passed Steve the bottle and they were off to John and Sandy's to pass around some samples. On their return Steve brought out the Campfire-in-a-Can and we enjoyed a wonderful evening catching up. After a bite to eat...and probably too much wine/beer...we called it a night. Steve and I both woke up very early Thursday morning...after tossing and turning and not being able to get back to sleep, we decided to get up. It wasn't even 5:00 yet! Sheesh! It was a beautiful sunny day...although a little chilly. As a matter of fact, a cold front is moving through with a freeze warning forecast for tonight...temps to dip down to 27F/-3C. Daytime highs only in the mid 50'sF/mid teens C.
Steve and I went down to the club house to sign up for the Christmas events...Christmas Eve party/gift exchange and Christmas Dinner. Then to the office to sign up for the New Years Eve party. With that done, we went for a walk around the RV park. Steve decided to fill the water tank and disconnected the hose and filters in preparation for the freezing temperatures forecast for the next couple of nights. We all spent a couple of hours catching up...so wonderful seeing you again, Dave and Diane, particularly since it sounds like we may not see you in Q this year. Let's get together again over the next couple of weeks! Back home, we all chilled for a few hours...seems no one had a very good sleep last night, so an afternoon siesta was in order. After that, we joined Red and Pam for a light dinner at their place...an easy soup recipe that Pam makes called 2x4 Soup. The ground meat was a mix of White Tail and Axis Deer venison Red and Jim harvested. Delicious, Pam...it hit the spot! Thanks! The weather forecasters were right...we woke Friday morning to freezing temperatures...27F/-3C Brrr! We had left a small heater running all night...and the furnace set for 55F/13C also came on. We're certainly glad that Steve had disconnected the water. A chat later on with Karen revealed that a lot of folks didn't heed the warning and a number of water pipes burst. Mid morning Pam and Red popped over to say goodbye. They are continuing onto an RV park in the Sun City area. After big hugs, they were off...looking forward to spending more time with you next month in Quartzsite! Steve spent the morning reviewing the video taken the other night with his GoPro and saving still shots from it. We would have loved to just post the video on YouTube but it was almost 20 minutes long and would have taken up major data. So he was left with the task of getting pictures from it to post on the blog. While he was busy doing that, I decided to get out for some exercise...so walked all around the campground. By late morning, he was done...now it was time to head into Casa Grande. We had a couple of propane tanks that needed filling and we also had to pick up a couple of gifts for the Christmas gift exchange party. On our way we saw this semi...wow, that's a lot of cotton! Our first stop was at the C-A-L Ranch Store (never heard of them before) where we were told they had the best propane price ...$2.09/gallon. With that errand complete, we headed to Walmart...OMG, what a zoo! Luckily Steve found a parking spot in the very far corner of the huge lot for Buster. We were successful in choosing a couple of bottles from the liquor isle as gifts...then Steve went back out to the truck to wait while I picked up a few more things. It took longer to get through the line up at the cashiers than my whole shopping trip did. A smile...and great patience were paramount today! Back home, we had a bite to eat and then went out for a walk around the campground (the second for me). The sunshine had really warmed things up and it was a beautiful afternoon. We stopped and chatted with Wayne and Karen...and found out that Gib is the fellow to talk to about joining the group for ATV rides. So we introduced ourselves to him. Everyone here at the park is so friendly and nice. He said he'd let us know when they were hitting the trails again. Saturday we woke to another chilly morning...31F/-0.5C outside and 52F/11C inside. We stopped and chatted with Wayne...and admired his handiwork. What a great idea for an outside clothes line. We then ran into Karen and Sandy who were also out walking. Karen invited us over for happy hour this afternoon...looking forward to it! We continued our walk along each road, look at the size of this cactus patch! After our walk, Steve got busy outside taking care of a bunch of chores while I made the appetizer for tomorrow's Christmas Eve party....and put together a small platter of cheese, sausage, pickles and crackers for happy hour today. At 3:30 we headed down to Karen and Wayne's for happy hour...their neighbours, John and Sandy joined us. We enjoyed great food (including more delicious Dove) and conversation with our new friends! We called it an evening a couple of hours later, as it got a bit too chilly to sit outside. It didn't get as warm as forecast today...it ended up being much cloudier than was expected. Not to worry, though, the forecast for the next few days is lots of sunshine with highs into the low 70's F...20's C! 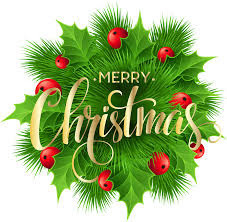 Steve and I would like to take this opportunity to wish all of our family and friends a Very Merry Christmas! I recognize that bottle of 43! Good stuff. We had an Axis roast last it was pretty good. Nice that you we able to get together with Red, Pam, Dave and Diane. Merry Christmas! What, Casa Grande a flood plain? Hah, my GF spent a wet winter there years ago, and there's no drainage anywhere. The upside was that the wildflowers in March were out of control! It's definately very flat around here. Everyone in the park has been telling us about all the standing water in the park when it rains. Another nice park you have found. And a new drink! Life is good! It's obvious most of the people here have been coming to this park for years, everyone is so darn friendly. Merry Christmas you social butterflies :) Looks like a nice park and you can ride quads from your site, that's perfect. Have fun while we enjoy a week of -30 temps with wind chills in the -40s.....awesome. Hopefully this will be your last cold winter and we'll see you down south next year!